This post was contributed by Ken Puls and Miguel Escobar, Power BI experts and authors of the new ebook, "[M]agic Tricks for Data Wizards". Have you ever wanted to consolidate, combine or append data from multiple excel spreadsheets or workbooks? I bet you have, and it has been a painful process either done manually or via 3rd party add-ins. 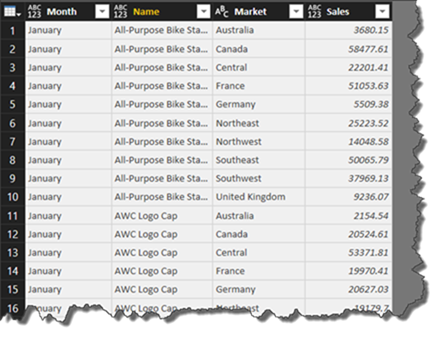 In this blog post, we’ll show you how, with the newest version of the Power BI Desktop and Power Query for Excel, you can combine multiple data from Excel files into one big tall table. Each of these files has only 1 month of data – we’ll have a file for January with just 1 sheet in it that will have all of the data for January. These are all Excel files living a happy life in SharePoint – we get these files via email from the provider and then store them on our Office 365 group every month. 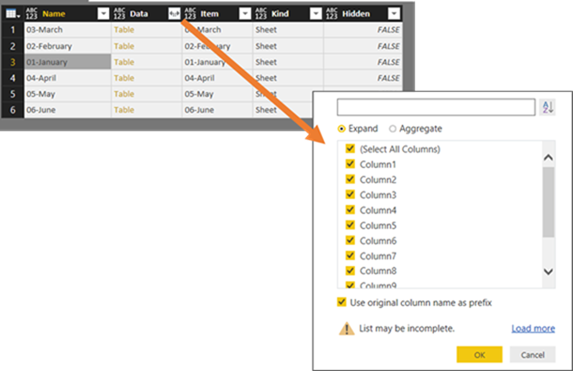 All of the files have the same structure, but different sheet names – all of the files only have 1 sheet and all of them have the same headers, but in a real case scenario the Power BI desktop and the process described here will work if you don’t have the same headers on all of the files. 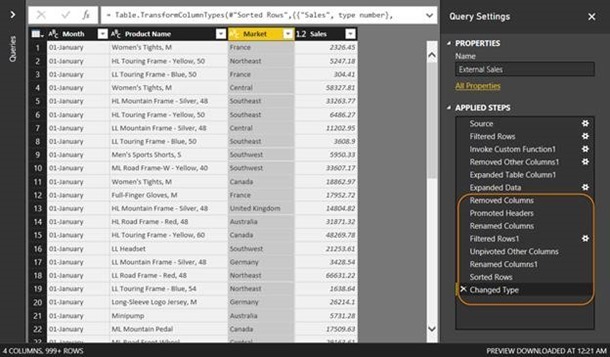 Clean and transform the data – ultimately, we want to unpivot some columns and also make the table more manageable to use with the Power BI Desktop and the DAX language. 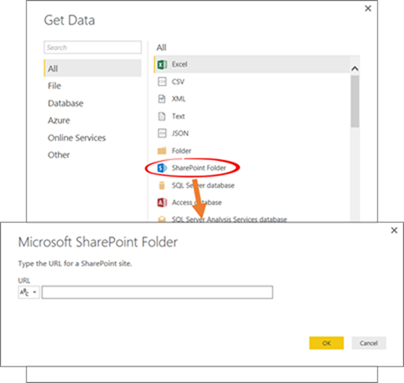 First things first, we need to get the data and the Power BI Desktop makes it easier for us to get our data from either SharePoint or any O365 Group storage. From the Get Data experience, let’s find the option for “SharePoint Folder”. This option will only require a text string which would be the URL for a SharePoint site. Where can I find this so called url? Which one of the urls found in SharePoint should I use?? 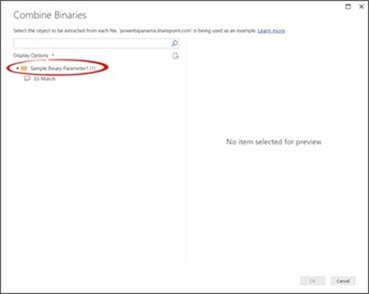 My SharePoint site root url is https://powerbipanama.sharepoint.com/, but all of my files are actually in another site that starts with https://powerbipanama.sharepoint.com/sites/externalsales/ URL. In my own case, I’ll be using the https://powerbipanama.sharepoint.com/sites/externalsales url in order to connect to my site. Once you input the url, you’ll then be asked for your credentials – be sure to select the “Organizational” type for your credentials and enter the same credentials that you use for your SharePoint site. Now that we’re in, we’ll be able to see all of the files from all of the folders that we have access to in that specific site. This might be a pretty long list, so let’s do some filtering on the “Folder Path” column and select the folder where your data is being stored so you only get the files from it. Filtering is key so you always get the files from the folder that you want. You can select multiple folders if you’d like as well. We now have all of the files that we want to combine but, how do we combine these files?? What kind of magic is needed to consolidate all of them? Surely it can’t be just 1 click to combine them, right? Let’s find out. You might remember this popular posts from Microsoft itself on how to combine text and CSV files. 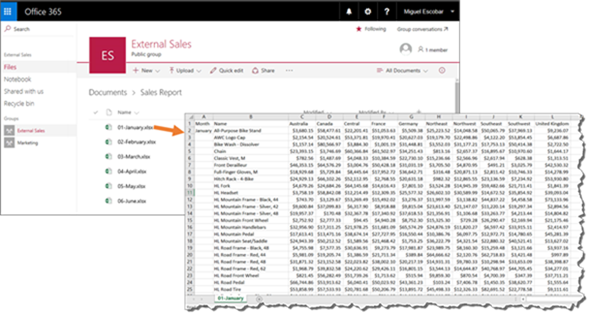 It used to throw weird results with Excel files, but that changed with the latest version of the Power BI Desktop and Power Query. 1. A new window will appear called ‘Combine Binaries’ – it will first find the first Binary from the table, which in our case is 03-March.xlsx, and it’ll create a sample function that will be applied to all of the other binaries. In this window, you’ll see all of the objects found in the 03-March.xlsx file. 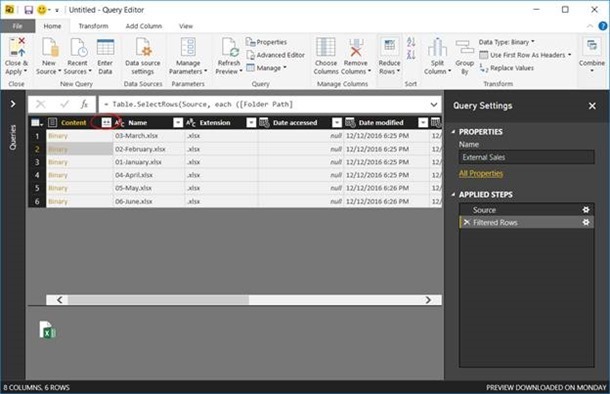 If you select for example the 03-March spreadsheet, the same process will be applied to the rest of the binaries so Power Query/Power BI Desktop will extract the data from the 03-March spreadsheet from each file. This is not our case. Each of our files has a different sheet name, so we recommend for these of cases to select the “Sample Binary Parameter” and click OK on this window. After just 1 click, you have all of the data ready to be combined on the “Data” column. The elements within the red and orange outline were automatically created by the tool. YES!!!! All of the data from all of the 6 Excel files has been appended and now we have a table with all of this data. Last but not least, get creative and create a report based on your consolidated data! Of course, you could integrate this new table to an existing data model to add even more context to your sales performance and understand how you’re doing in each market. 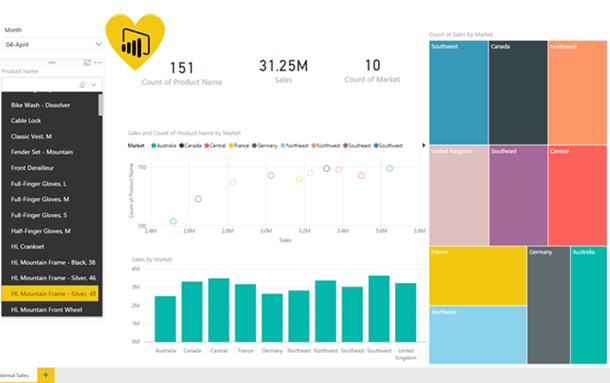 We would like to take this opportunity to tell you about an upcoming ebook for tips & tricks when working with the Get Data experience in the Power BI Desktop, a.k.a. Power Query. The cool thing about this ebook? It’ll be completely FREE!! Visit our website to get more information about the ebook and how to get it.